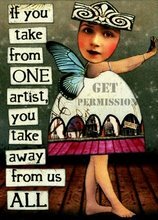 One of the first sites devoted to mixed media art, and a great source for free graphics. Great digital supplies for digital and traditional mixed media projects. A Yahoo group with lots of great mixed media tutorials, swaps, and challenges. Source for amazing digital art and scrapping kits. Creator of the wonderful Art Journal Caravan, Tangie offers supplies and classes for the digital and traditional art journalist and mixed media artist. Check out the whimsical artwork of Marsha Jorgensen, and discover her beautiful collage sheets and digital art kits. You don't have to be a scrapbooker to get excited about National Scrapbooking Day. There are lots of freebies, bargains and activities for the multi-media artist and digital artist as well. I have been spending a lot of time at Deviant Scrap this weekend, chatting with friends and overspending my art budget. This morning, I finished up an artist trading card for Tumble Fish Studio's Distant Relative ATC challenge. I dug out an old photo of my great uncle Jimmy, a lover of fish, and apparently a bit of a dandy in his younger years. Credits: Tumble Fish Studio's Male Persuasion, Something Fishy, and At the Beach kits. In the Save the Drama for Your Momma challenge, Holliewood Studios provides us with a stage on which to mount our own family story. I had way too much fun with this. Credits: Everything is from Deviant Scrap. The stage is by Holliewood; the girls are from Tumble Fish Studio's Ooh La La. And, finally, I took advantage of Tumble Fish Studio's free Family Album download to participate in just one more challenge. Doing the captions was a blast. Credits: Photos from Tumble Fish Studio's Family Album freebie; everything else from the Deviant Scrap Family Picnic kit (free this weekend). The font is Jane Austen.